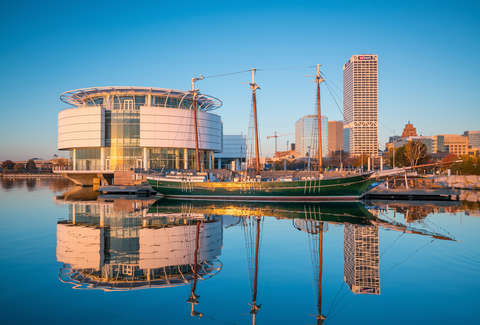 While the consensus seems to be that 2016 couldn’t end quickly enough, Milwaukee was still a beautiful place to spend it for many of those 365 days. And here’s the proof -- these gorgeous photos (thanks Instagram!) allow us to look back on and remind ourselves that, hey, even when things aren’t going great, at least we live in a pretty awesome (looking) city. If you can get up early enough, the sunrise over the lake is worth missing a few non-waking moments. That takes some serious backwards writing skill. Having a mirror helps! The Riverwalk looking good as always not matter the time of day. Every Milwaukeean should make the trek out to the Red Lighthouse at least once. We dare you to not drool over Oscar’s Frozen Custard (even in the winter). Is anyone else worried that Stay Puft Marshmallow Man might show up? That light can make even the most non-descript parts of downtown beautiful. A Wisconsin Brandy Old Fashioned served by the fine folks at Blackbird Bar. MKE's City Hall is a state treasure especially during the holiday season. No, this is not some tropical island. This indeed MKE. The skyline over Lake Michigan had some big changes this year. Even our storms can be beautiful, especially once they’re over. Some think this sculpture might be an eyesore to some, but it's looking pretty good from this angle. Fall on the Seven Bridges Trail in Grant Park. If this pile of meat and carbs from Cafe Benelux isn't pretty to you, you probably not a local. This little snail calls The Mitchell Park Domes its home. We love our city but sometimes we need a big, bold reminder of the state in which we live. Lacey Muszynski is a Milwaukee native who had way too many photos to choose from. Follow her on Twitter @worthhersalt.